With that install add the new script tag into your main.html file. Looking at the code you can see that we use ‘ngRoute’ as one of the dependencies tell angular that we loaded Angular Route js file and use it. Then we have our configuration block as config function. This is where we setup different routes that the application going to accept and respond. The config function takes couple of parameters, here we use $routeProvider and $locationProvider for now. 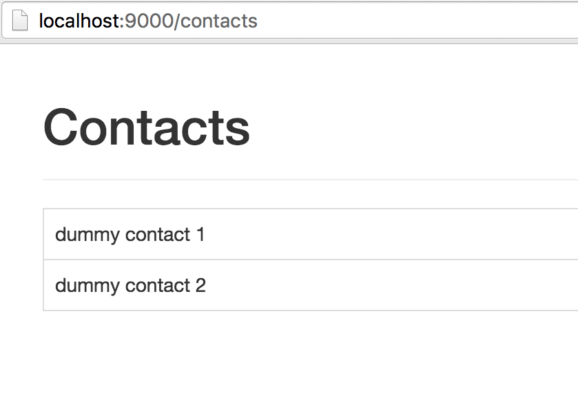 After that we are using the $routeProvider to setup that when the browser calls “/contacts” from URL the application will responds by sending the list.html file and control the content of the html file dynamically as it passed through the controller function that here we called “ListController”. To test out application so far make sure you have added the new controller.js file into main.html to be loaded as well. Run the application and go to http://localhost:9000/contacts to test your application. Although it is just a table with dummy data but we will be sending data to Angular JS using REST API that we going to develop on the backend using node JS. The way angular reacts with a REST database is through Angular Resource library, so we need to develop a REST API on the backend and then write some Angular Resource code to interact with backend. So in next tutorial (Part 3) I will show you how to develop a simple REST API using Node JS and Express JS, which are connected to an actual database such as MySQL or PostgreSQL.